Friends of Marty is proud to announce Brittney Hollinghurst as the next recipient of the Friends and Family of Marty Boryczewski Scholarship. 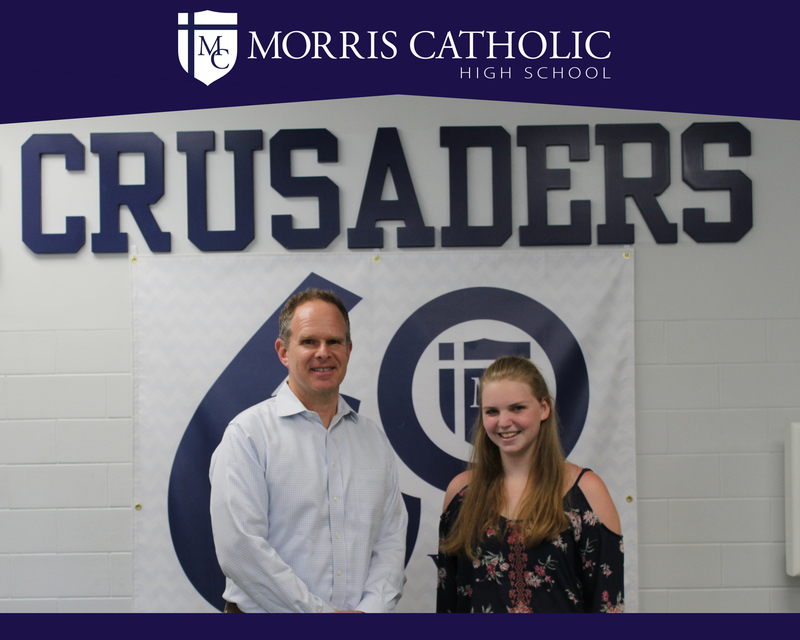 Brittney will receive $5,000 towards her tuition at Morris Catholic High School in each of the 2018-2019 and 2019-2020 school years. Brittney was kind enough to provide us, and the entire Friends of Marty support system, with some words of her own. “My name is Brittney Hollinghurst and I will be starting my Junior year at Morris Catholic High School. I have enjoyed Cheerleading since before I can remember, and I am happy to say that I am on the Varsity Squad for the second year. Prior to my Freshman year, I had to have extensive surgery on my knee and I was so afraid I would not be able to participate in anything; however, based on dedication and the help of the coaching staff at Morris Catholic, I was able to be the CRUSADER, the Mascot, and was able to help represent the school on and off the field. I am truly honored to have been selected as the recipient of the Friends of Marty Scholarship. This Scholarship will enable me to continue my education at Morris Catholic High School. This is not only a great opportunity for me, but this will also be a big help for my family. My family has done so much to ensure that both my sister and I are able to continue to receive the best possible education. I am looking to the future and want to become a Teacher of Early Childhood Development with a specialty in Special Education. I am currently touring Colleges to find the right fit for me. Friends of Marty is so very honored to have Brittney be a part of our organization. Her dedication and fight to achieve the goals she has set for herself is definitely something we all saw in Marty. We are excited for Brittney to carry on the tradition of being a Friends of Marty scholarship awardee. Welcome Brittney, and by extension your entire family, into the Friends of Marty family.